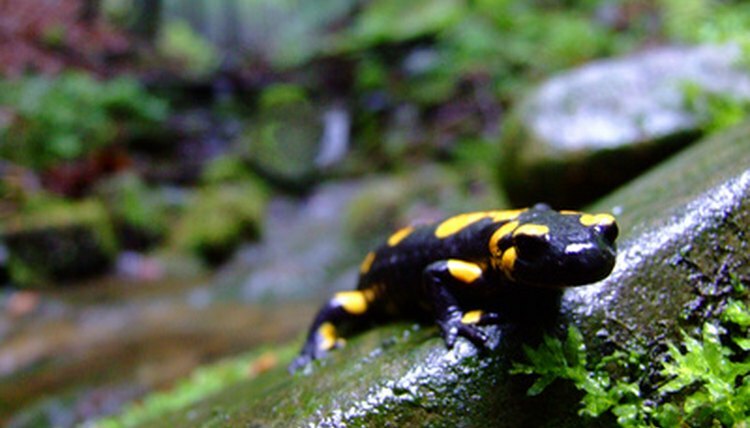 Although not commonly kept as pets, some salamanders are raised in captivity. Salamanders are interesting to watch, and come in a variety of different species. Salamanders lay their eggs on underwater plants, and the eggs hatch underwater as well. Raising salamanders in captivity can be entertaining, and can help you gain more knowledge about the tiny aquatic creatures. However, hatching salamander eggs can be challenging. It’s important to know what the eggs need, so they hatch correctly. Separate the eggs and the adult salamanders. Salamanders often eat their own eggs after they have laid them, so this step is essential. You can separate the eggs and adults by removing the adult salamanders from the tank, or you can remove the eggs. If you remove the eggs, you can keep them in a small, open container. Reduce the amount of aeration and water flow in the tank. In a large aquarium, this may mean turning the filter and aeration system off or down or moving the eggs slightly away from the air source. If you keep the eggs in a separate, small container, you don't need to supply any aeration or current. Keep the tank clean. If you’re keeping the eggs in the aquarium, this means cleaning the tank as you usually would. Be gentle with the eggs. For eggs in a separate container, gently change about half of the water in the tank daily, and move the eggs to a fresh, clean container twice a week. Observe the eggs. Some eggs will not hatch, and these may start to go bad, getting moldy and fuzzy looking. Remove any eggs that you see that look like this. They can contaminate the other eggs. Wait for the eggs to hatch. This could take anywhere between one and three weeks, and depends entirely upon the species of salamander eggs you have. Start feeding your salamander babies, or larvae, on the second or third day. Before that, the nutrients from the eggs they hatched from should be enough to keep them nourished. You can feed the larvae newly hatched brine shrimp or microworms. Keep the baby salamanders separate from the adults and from larger larvae, as they might be eaten. Release the baby salamanders back into the tank with the adults only when they are fully grown.